Today we serve our Tuscan Kale Pasta with Montenidoli Vernacccia, made by Elisabetta Fagiuoli, for the February Wine Pairing Weekend event. Read on for all the details, or click here to jump down to the recipe or here for background on the winery and winemaker. When we decided that the February Wine Pairing Weekend would focus on Women Owned Wineries and Women Who Makes Wine, I immediately thought of Elisabetta. Picture Elisabetta Fagiuoli, a spry Italian woman well past the age many people retire, proudly holding court behind a table with an array of the Montenidoli wines she has been producing for decades. She is eager to share with us her wine and the passion that has been poured into making it. Elisabetta has visited our favorite local wine shop, Pairings Wine & Food, several times. During her most recent visit last summer, she had four of her wines available for sampling, including the Vernaccia that we are pairing today with Tuscan Kale Pasta. As we sipped Elisabetta’s wine, she painted a picture for us of the Tuscan vineyards that produces some excellent fruit. We started with the Vernaccia, an Italian white wine varietal most closely associated with San Gimignano, where Montenidoli is located. Will talk more about the wine and Tuscan Kale Pasta pairing below. After sampling a refreshing rosato made from Canaiolo grapes, we moved on to two of Elisabetta’s red wines. Though she clearly loves all her wines, I did sense a bit more enthusiasm for the full-bodied, big red wines from Montenidoli. As we sipped the 2015 Montenidoli Garrulo Chianti Colli Senesi ($20, 14% ABV), Elisabetta urged us to enjoy this Chianti with pasta. 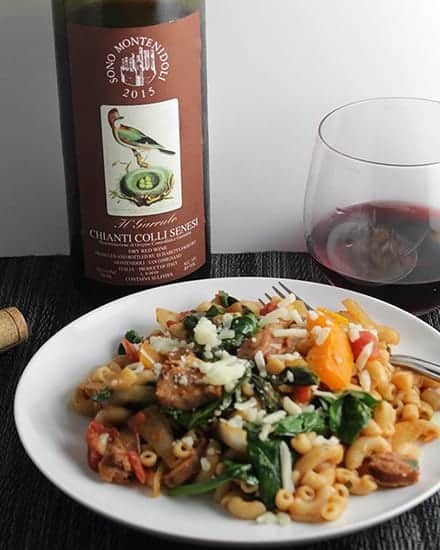 This is not the type of advice I am inclined to dismiss, so I paired this Chianti with our Rustic Pasta with Chicken and Sausage shown above and was very pleased with the results. If you somehow have a notion that a woman winemaker is likely to produce light, ethereal wines, Elisabetta’s Sono Montenidoli will blow that assumption out of the water. This is a “beast” of a wine, in a good way, as the tasting sheet puts it. This Sangiovese based wine needs a couple hours in the decanter or some cellar time to make it approachable. This is to go with the meat, Elisabetta notes. Image credit: nnike on Widimedia Commons. The following background information comes from the Montenidoli website, and what I’ve heard from Elisabetta and friends that have visited there. 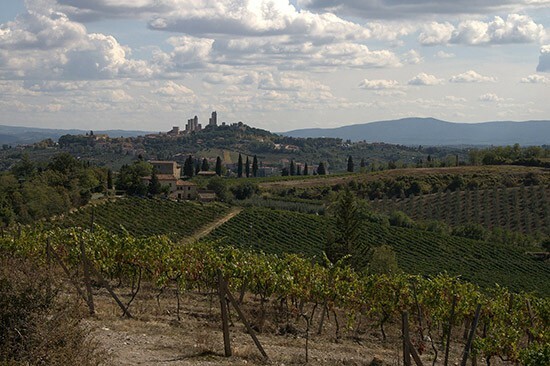 The San Gimignano hills where the Montenidoli Winery was established had been abandoned by farmers in the early 1900s. Elisabetta and her husband Sergio moved there in 1965 to raise their family. Sergio was a teacher, but caring for the land was in Elisabetta’s blood. Her family cultivated vines and olive trees outside Verona. Much of her childhood was spent wandering the vineyards of Valpolicella. The vineyards were overgrown with brambles when they arrived, but Elisabetta set to work. As my friends Ray and Lori from Pairings said upon visiting Montenidoli, Elisabetta is “a force of nature”. Using organic methods that rely upon the Tuscan sun and soil, the first Montenidoli wine was born in 1971. In addition to the wines I mentioned sampling, Montenoldi now produces several other wines made from native Italian grapes. When Elisabetta isn’t on the road sharing her wines, she can often be found in the vineyards caring for her grapes. My idea for the Tuscan Kale Pasta recipe was based on one of our go-to weekday recipes, this Penne with Red Lentils and Ginger. That recipe features spinach for the green vegetable, I thought I’d try making it with some kale. To give it more of an Italian flavor, we increased the garlic and skipped the ginger, and swapped Tuscan kale for the spinach. You might ask, “what is Tuscan kale?”. Tuscan kale also goes by the names “lacinato kale” and “dinosaur kale”. The latter is probably the most descriptive term, as what I’m calling Tuscan kale features bumpy dark green leaves. 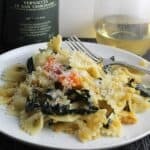 It is a bit more delicate than basic green kale, and I thought that would work better for cooking relatively quickly for this Tuscan kale pasta dish. 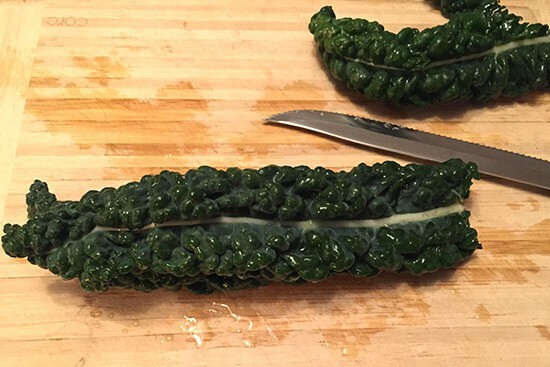 Want to try another recipe with Tuscan kale? Give our Tuscan Kale Pesto Risotto a try! The Montenidoli website suggests their Vernaccia is good with olive oil based dishes. Our Tuscan kale pasta starts by sautéing some garlic and red bell pepper in some olive oil. That is followed by adding the Tuscan kale and red lentils, along with some broth. Note: I used chicken broth with good results, but you can use vegetable broth or water to keep the dish vegetarian. The 2015 Montenidoli Tradizionale Vernaccia Di San Gimignano ($19, 14% ABV) is straw colored in the glass, with green apple on the nose. Taste of pear fruit with notes of almond on the finish, and notable underlying minerality. 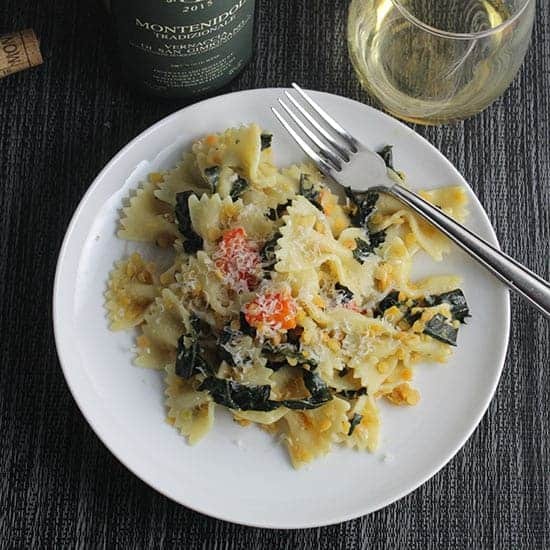 Definitely a wine best with food, and our Tuscan Kale Pasta is a good match. 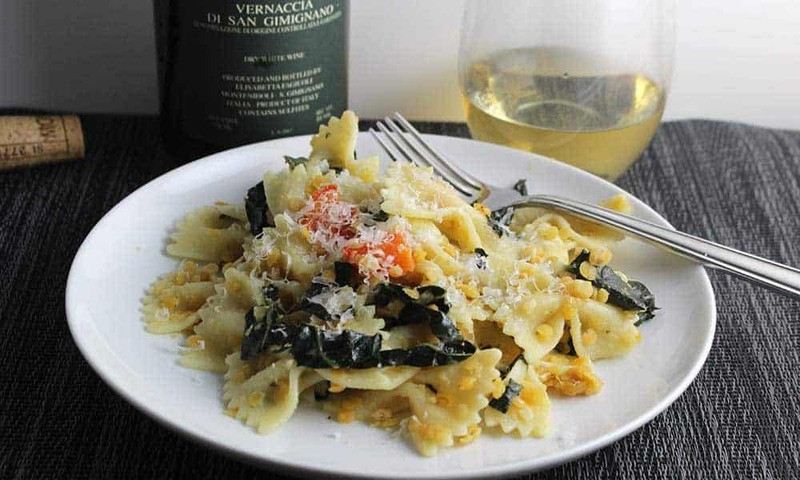 In particular, the Vernaccia pairs well with the Parmigiano cheese we add to the pasta. This Montenidoli Vernaccia also goes well with artichokes and seafood. 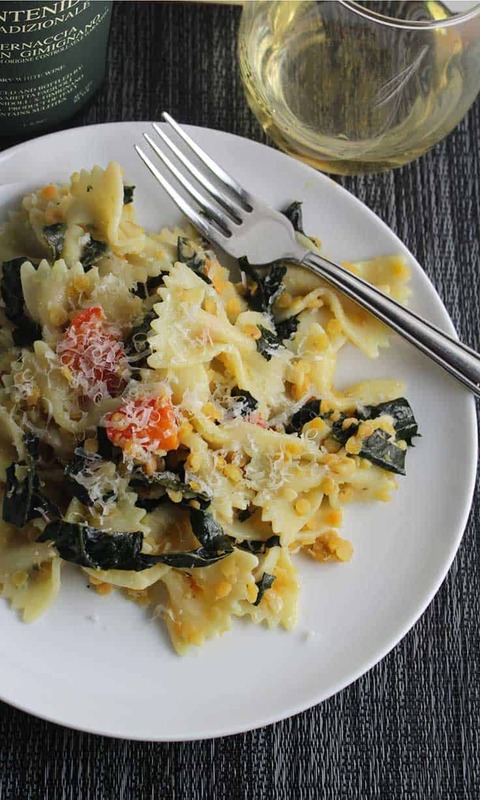 Tuscan kale cooked with garlic and red lentils, tossed with pasta, for a an easy and healthy vegetarian meal. Pairs well with a Vernaccia and other Italian white wine. Heat the olive oil in a skillet on medium heat. Add the bell pepper, sauté for about 3 minutes, then add the garlic. Sauté for another minute. Gradually add the kale to the skillet. Stir to combine with the garlic and pepper. Add salt and pepper to taste. Add the lentils and broth to the skillet. Bring to a simmer, then cover to simmer on low heat for 10 to 12 minutes, until lentils are soft. Keep an eye on the skillet and add extra water if needed to keep the vegetables and lentils moist. When the lentils are tender after about 12 minutes, remove the skillet from heat. Keep the skillet covered so that the kale and lentil mixture stays warm. Cook the pasta according to package instructions while the lentils and Tuscan kale cook. Drain the pasta when cooked to your liking, and toss immediately with the Tuscan kale and lentil mixture. Plate and serve with an Italian white wine. Be sure to check out all the great Wine Pairing Weekend Articles about Women Owned Wineries and Women Winemakers! And join us for a live Twitter chat on the topic, using hashtag #winePW, at 11 a.m. ET and 8 am PT on Saturday, February 10, 2018. I really enjoy your simple-to-prepare week night dinners. They’re always full of flavor but don’t require obscure ingredients or lots of time in the kitchen. I’ll have to try this one! Wines sound good, too; I’m totally intrigued by the Cannaiolo Rosato! Thanks Lauren! Homecooked meals definitely easier during the week by keeping it simple! dinosaur kale. I love it! The recipe and pairing sounds perfect! Kale of any kind is a family favorite. I will have to try it in pasta…and track down some of Elisabetta’s wines. I love the descriptions of Elisabetta and her wines — she seems like a wonderfully feisty lady! Both of the pasta dishes look delicious as well! Yum! This looks fabulous! I’ve never tried tuscan kale before, but it looks really tasty here, and the wine pairing sounds delicious as well! I tend to grab the Tuscan kale if I see the “regular” kale is looking a bit fatigued at the store. Looks so delicious and perfect for a fancy dinner! I love kale and don’t use it enough! There a lot of great ways to use kale! This is such a delicious looking dish. I love kale but never think to use it, whoops! I may have to make this as a meal for just me and the husband – it looks so tasty! We eat a lot of kale here! Bow ties are a favorite here. My grand son calls them bow tie butterflies. I know he would love this when I make this one and he will also get some great vitamins with the kale so its a healthy and pretty dish! That’s a fun name! Yes, definitely lots of nutrition here. This looks amazing! I will definitely be giving it a try this coming week!